Vocabulary-building workshops, games, culinary ideas, and early science activities that are sure to make book lovers out of the children in your group. Word flashcards, activity sheets, a picture game, writing activities, puppets, crafts, stickers, and so much more reading fun for preschoolers. 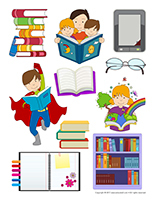 (Open stickers-Books) Print the illustrations on adhesive paper and use them to create original stickers for your group. 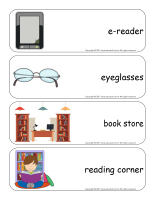 (Open educa-theme-Books) Print and laminate the different elements representing the theme. Use them to present the theme to your group (and their parents) while decorating your daycare. 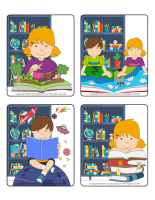 (Open educa-decorate-Books) Print, laminate, and cut out the illustrations. Use them to decorate your walls and set the mood for the theme. Purchase an attractive giant poster that children are sure to love. Stick it on the ceiling over your changing table or a play mat. Let children discover the poster on their own. Transform your daycare to represent a library. (Open poster-Library) Print and display on your daycare door. Display your library’s opening hours. Make your daycare comfortable by adding cushions, a small couch, bean bag chairs, stuffed animals, etc. Highlight your reading corner. Display posters on the walls and add extra armchairs and cushions. If possible, expand your space as much as possible for the duration of the theme. Find a large cardboard box (appliance) and add it to your reading corner to create a special reading nook. Hang tiny Christmas lights and decorations in the box. Set a book on your head to welcome children in the morning. (Open models-Books) Print and let children decorate the garland elements. Cut out the items and use them to create a garland that can be hung near your daycare entrance or within your daycare. Set up a display containing different types of books (dictionaries, recipe books, atlases, bank books, comic books, chapter books, photo albums, diaries, etc.). 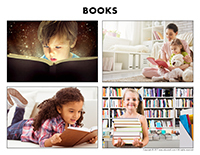 Decorate the walls around your book display with pictures of the children in your group enjoying reading-related activities. If you wish, you may also add pictures or illustrations from your group’s favorite books. (Open picture game-Books) Print and laminate the pictures in the format you prefer. Use them to spark a conversation with your group. Ask children questions about books to discover which types of books they enjoy the most. Have you ever visited a library? Who did you go to the library with? What types of books did you find? Do you have books at home? What does your mother/father read? Do you enjoy story time? When do you like to be read to most? Who usually reads to you at home? (Open Poni discovers and presents-Books) Print and laminate the pictures. Use a Poni puppet (or another puppet children are familiar with) to present the pictures to your group. (Open puppets-Books) Print the various models on cardboard. Ask children to cut them out and decorate them with arts & crafts materials. Glue a Popsicle stick behind each one to complete the puppets. (Open thematic letter-Reading) Print the letter. Decorate a box and set it somewhere in your daycare where children are sure to find it. Read portions of the letter each day and enjoy the suggested activities throughout the theme. The pictures may be used as a memory game or to spark a conversation with the group. Use them to decorate the daycare or a specific thematic corner. (Open picture game-Books) Print, laminate, and store in a “Ziploc” bag or in your thematic bins. (Open picture game-Books) Print the pictures twice and use them for a memory game. 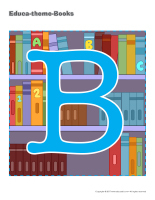 (Open writing activities-B like book) Print for each child or laminate for use with a dry-erase marker. (Open educa-nuudles-Books) Print for each child. Have children color the sheet and use Magic Nuudles to give it a three-dimensional look. Variation: You don’t have Magic Nuudles? Have children fill the spaces designed for Magic Nuudles with bingo markers or stickers. To order Magic Nuudles. The educatall club contains printable documents that can help you plan and organize your workshops. 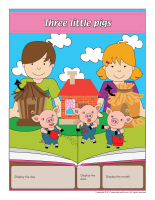 Use the Three little pigs book to encourage children to build brick, hay, and wood homes. Provide the necessary materials. Invite children to use blocks to represent the homes that are illustrated in their favorite storybooks. Add old books and magazines to your area and show children how they can use them to build various structures. Colourful paper, hole-punches, and ribbon for creating books. Catalogues children can cut pictures out of. Children can stick them on large pieces of cardboard to create stories. Foam letters or stencils children can use to trace letters. Felt pieces for creating a fabric book. Cardboard boxes that can be decorated and stacked to represent bookshelves. Scrapbooking paper and accessories for creating unique scrapbooks. Coloring pages involving characters from well-known storybooks. Fine-tip markers for exploring calligraphy. Transform your area to make it look like a printing shop. Add stampers, stamp pads, papers of all kinds, etc. Transform your area to represent a library. Add books, bookshelves, a computer keyboard, paper, crayons, index cards, etc. Add a few comfortable armchairs and a small table. Decorate your reading corner to make it look like a library. Add bookshelves, comfortable armchairs, posters on the walls, etc. Library cards and various accessories children can use to pretend they are librarians. Memory game using educatall.com picture game. 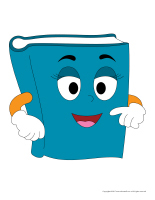 Different types of books in all sizes: dictionaries, cardboard books, magazines, small books with no pictures, recipe books, telephone books, etc. A poster with the letters of the alphabet. Comic books, chapter books without pictures, recipe books. Staple several pre-writing activity sheets together to create writing booklets. Connect-the-dots that reveal books or library-related items. 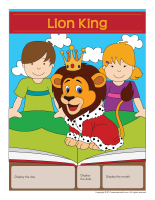 Activity sheets related to the theme or well-known storybooks. An old typewriter children can use to type like a writer. Create an obstacle course that children must complete with a book resting on their head or between their legs. A bin filled with crumpled balls or strips of newspaper. A bin filled with recycled paper. Use a scale to weigh different types of books and determine which one is heaviest/lightest. 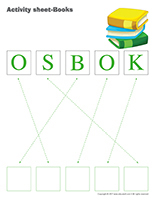 (Open word flashcards-Books) (Open giant word flashcards-Books) Print and laminate the word flashcards. Have each child pick a word and present it to the group (ex. bookmark). Ask them questions to see what they know about the theme. Glue four pieces of black felt on a large piece of cardboard to create a felt board and hang it on a wall. With your group, cut shapes (characters, letters, numbers, etc.) out of colourful felt. The felt items will easily stick to your board. Children will enjoy using them to create a variety of scenes and stories. Set several books on the floor and let little ones explore them. Never underestimate how interesting books can be for babies. Introduce one short story every day before naptime, making sure you always read to them in the same spot. In just a few days, children will rush to your reading area as soon as they see you pull out a book. Create unique picture books for the youngest members of your group. Simply collect pictures and illustrations of all kinds and arrange them in a photo album. If you prefer, laminate them or insert them in Ziploc bags. Fill a bin with catalogues and set it in on a shelf that babies and toddlers can easily reach. They will enjoy manipulating the pages, admiring the colors, observing the characters, etc. Use the bottom portion of milk cartons to create homemade blocks children can play with. If you wish, stick pictures of their favorite storybook characters on each side. (Open word flashcards-Books) (Open giant word flashcards-Books) Print and stick a different word on the back of each chair. To play musical words, play music and invite children to walk around the chairs. When the music stops, children must quickly find a chair to sit on and name the corresponding word. Repeat if children seem interested. 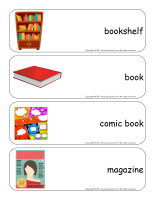 (Open word flashcards-Books) (Open giant word flashcards-Books) Print and laminate. Set all the flashcards in the centre of your parachute or on a blanket. Have children hold on to the edges of the parachute. When you give the signal, they must raise it up high to send the flashcards flying. As they fall back down, children read the words they collect. (Open miniature books) Print and laminate. Hide the books throughout your daycare. Invite children to search for them. The child who finds the most books can hide them for the next round. 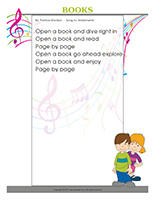 (Open string activities-Books) Print for each child. Children use wax strings (Wikki Stix) to trace the lines. If you prefer, have them trace the lines with glue and set pieces of regular string on the lines. Collect several pictures and illustrations that have been torn out of books and glue them on items throughout your daycare. Use the walls, cupboards, and even the floor. Children will love exploring the pictures and illustrations as they go about their day. Encourage children to move around the daycare with this activity. Deposit several items containing illustrations in different gift bags. Fill the bags with books, pictures, and magazines. Set the bags here and there and let children explore their contents. Create an obstacle course with books. Children can, for example, go around bookshelves. Add obstacles such as a ruler or a dictionary that children must jump over, two chairs they must crawl under, etc. Incorporate items you have. You could use a small slide and set cushions from your reading corner at the bottom. Try to encourage children to move in a variety of ways (crawl, jump, spin, backwards, etc.). Older children will enjoy helping you build the obstacle course. Use colourful adhesive tape to draw a simple path on the floor. Add a balance beam, cones, etc. Children must complete the path while balancing a book on their head. If the book falls, they must stop and replace it before continuing. When you are out for a walk, have children find two medium-size rocks. When you get back to daycare, set a bin filled with water on the floor. Let children wash their rocks in the bin. When they are done, set the rocks out to dry. Once they are dry, let children paint their rocks and sprinkle glitter over them. When they are dry, children can use them as bookends. You will need two backpacks (one per team), two bags containing the same number of books, and two empty bins that you will set at the opposite end of your daycare. Divide your group into two teams. Children take turns picking a book out of their team’s bag, setting it in their team’s backpack, and carrying it to their bin at the other end of the room before running back to hand the backpack to the next child in line. The first team who has transported all its books wins. Just for fun, enjoy story time outside during the theme. You can bring the book you wish to read to your local playground, have your group sit in the bleachers that line your local soccer field, or simply sit under a large tree to read to your group in the shade. (Open perpetual calendar-Library Day) Visit your local library with your group or simply plan a special day filled with activities children can enjoy within your daycare to celebrate the theme (see suggestions further in theme). Plan a trip to a nearby playground, bring a special snack along, and read to your group as they enjoy their snack. 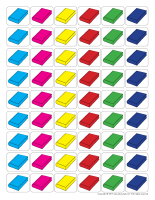 (Open color by number-Books) Children must color the picture per the color code. 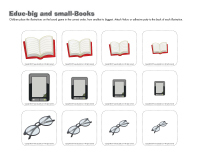 (Open educ-big and small-Books) Print and laminate the game. Children must determine the correct order for each set of cards, from the smallest to the biggest item, and arrange them in the squares using Velcro or adhesive putty. 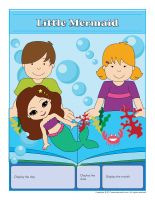 (Open story and memory game-Reading) Print, laminate, and cut out the illustrations. Place them face down on the floor. Children take turns picking three cards and inventing a story in relation to the illustrations. Trick: Glue each illustration on the top of a frozen juice can to solidify them. Variation: Print each card twice and use them for a memory game. 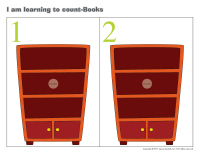 (Open I am learning to count-Books) Print, laminate, and display at children’s level. 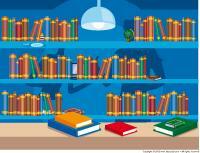 Children use Velcro to stick the correct number of books in each bookshelf, per the indicated number. Read a story, but stop reading before you reach the end of the story. Encourage children to complete the story as they see fit. Invite children to draw a “letter” for their parents. Mail their letters. (Open hunt and seek-The library) Print and laminate. Children pick a card and search for the item in the scene. 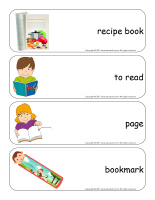 (Open word flashcards-Books) (Open giant word flashcards-Books) Print and laminate. Set a magnetic board and magnetic letters on a table. Children take turns picking a flashcard and using the letters to write the corresponding word on the board. Set several different books on the floor and ask children to sort them by color, size, shape, thickness, etc. Collect pages from old storybooks. Laminate them and stick a magnet behind each one. Display the illustrations on your refrigerator or on a magnetic board. Record yourself reading several popular storybooks. 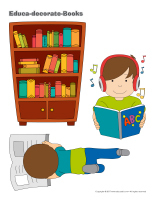 Play the recordings for your group and have them identify the corresponding book. Can they recognize the narrator? You will need 10 cardboard boxes. Identify each box with a drawing or item that represents a specific storybook. Fill each box with illustrations, figurines, or tiny accessories related to the corresponding story. Let children explore the contents of the boxes. Set several books under a table. Drape a dark-coloured blanket over the table. Hand each child a small flashlight that can safely be manipulated by little hands and let them enter your improvised cabin to admire the books in the “dark”. 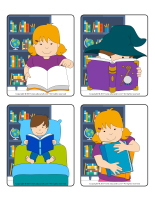 (Open personal reading log) Print for each child and display the logs on a wall, close to your reading corner. 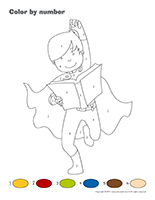 Children can stamp a character every time they finish a book. This simple tool may encourage children to explore more books. 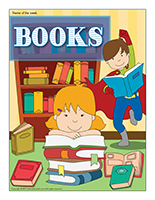 Books of all kinds: carboard, plastic, dictionaries, encyclopedias, picture books, recipe books, magazines, comic books, etc. Library cards, stamp pads, and stampers. Posters with children’s favorite storybook characters. A piece of tulle hung from the ceiling along with pink and purple lights. 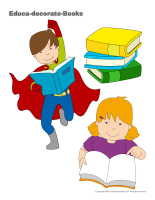 Invite each child to bring a book from home that he is willing to trade with another child. Children will be proud to bring their new book home. Encourage parents to read it to their child. (Open game-The library) Print and laminate the bar codes and the library cards. Children can use them to pretend they are librarians. Arrange two rows of chairs and set books on each chair. Set a table in front of the chairs (librarian’s desk). Children can take turns being the librarian. The other children can pick books they wish to borrow and present their library card. They can exchange their books as often as they wish, but only after having looked at every page. Set several books on the floor. To the sound of music, children dance around the daycare. When the music stops, they must quickly find a book to stand on. (Open word flashcards-Books) (Open giant word flashcards-Books) Print and glue one word at a time on a ball using adhesive paper. Play with the ball to the sound of music. When the music stops, the child holding the ball must name the word. Children pretend they are illustrators. They must use various tools (stampers, stamp pads, pens, rulers, stickers, boxes, wrapping paper, ink, cardboard, paper, bags, etc.) to draw scenes for a story. Set a few old typewriters on a table. Children pretend they are reporters for your local newspaper. Stampers and stamp pads, different colors. Waxed crayon shavings that you can melt between two sheets of waxed paper. Fill a large container with different types of paper: wrapping paper, tissue paper, sand paper, cellophane paper, newspaper, toilet paper, paper towels, computer paper, waxed paper, metallic paper, etc. Absorption: Which paper absorbs liquids best? Spray water on each one and compare the results. Resistance: Which paper is the easiest to tear? Which one is the strongest? Stains: Manipulate the papers and look at your hands to see if they stain your skin. Textures: Compare the different textures. Clear or opaque: Can you see through the papers? Prepare a store-bought cake mix with your group. Bake it in a rectangular pan (you may need two cake mixes). Once the cake is ready, let it cool and divide the rectangle into 4 or 6 smaller rectangles that will represent books. Prepare several different colors of icing and let children decorate their cake book as they wish. Provide candy pieces they can use to decorate their books. Let them eat them for dessert. Set several different grocery store flyers in your kitchen area. Have children cut out the food items they like most. Laminate them and stick a small magnet behind each one. Children will enjoy playing with the food magnets on a magnetic board. Set different recipe books in your kitchen area. Encourage children to look at the pictures for inspiration. (Open recipe book) Print several copies. Ask each parent to share one of their child’s favorite recipes. Once you have received one recipe from each family, make photocopies and assemble a recipe book for each child. (Open models-Books) Print the models and use them for your various projects and needs throughout the theme. 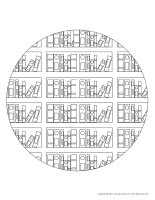 (Open mandalas-Books) Print for each child. Encourage children to color the mandalas to help them relax. (Open educa-decorate-Books) Print and cut out. Children stick the items on a strip of construction paper. Staple both ends of each child’s strip of paper together to form a simple hat. You will need string, old books you no longer wish to use (must be quite thick) or telephone books, folded pieces of white paper, and poster paint. To begin, children must dip a piece of string in the paint (each child can use one or more pieces), leaving approximately 2 inches paint-free at one end. 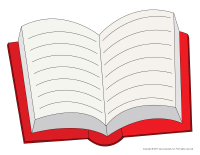 Have them place their folded piece of white paper in an open book (with the crease lined up with the book’s crease). Next, have them set their string(s) between both layers of paper, with the unpainted portion sticking out over the top of the book. Have them close their book and press down on the cover page before gently pulling the string(s) out. When they are done, let them open their book to discover a unique masterpiece. Measure a piece of brown paper (Kraft) big enough to wrap a book. Let children draw on the paper. When they are done, help them use it to create a book cover. Using pictures and illustrations of all kinds (catalogues, flyers, etc. ), invite each child to create a page representing your group. When they are all done, assemble the pages in a binder. Read them their story. The story may not make sense. At the end of the story, change the order of the illustrations and read it again. Use Alpha Bits cereal to write each child’s name. Let them glue the letters on a piece of construction paper. Create a unique texture book. Each page must be different. You can, for example, include silk, cotton, flannel, grass, paper, bubble wrap, etc. Use a hole-punch to make holes on the left-hand side of each page and insert ribbon to assemble your book. Use recycled materials if possible. Children work together to decorate a box that will be used to present the story of the day. (Open models-glasses) Print and cut out. Each child decorates his own glasses. Cut them out and glue cellophane paper inside the frames. Explore a popular storybook with your group. Recreate certain scenes, use them for inspiration for fun activities and crafts. Pick a story listed below, read it to your group, and pick and choose among the suggested activities. 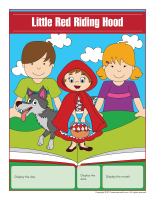 (Open perpetual calendar-Little Red Riding Hood) Print and display. Pick among the following activities. Provide clothing items children can use to dress up like an old lady. Set several wicker baskets on the floor and let children fill and empty them. Provide a red cape, a red scarf, a red coat, and red boots. Bake oatmeal cookies and serve them in a basket. Taste different types of cookies. Set up a small playhouse and act out the story. Go for a walk in the forest. (Open perpetual calendar-Lion King) Print and display. Pick among the following activities. Find lion costumes children can wear. Play with zoo animal figurines. Sort animals (feathers, fur, and scales). Walk like a proud lion with your head up high and roar. Paint each child’s face to make them look like lions. 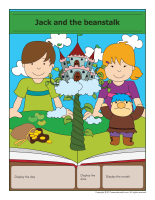 (Open perpetual calendar-Jack and the beanstalk) Print and display. Pick among the following activities. Use a cardboard box to build a house in the sky (stick clouds on the floor around it). Have children wear adult clothing items and encourage them to pretend they belong to the giant. (Open perpetual calendar-Three little pigs) Print and display. Pick among the following activities. Play with farm animal figurines. Use empty tissue boxes to build brick houses. Use bricks, hay, and wood to build three houses. Have fun blowing on different items to see if they will fly away or stay put. Paint with “hay” (give each child several drinking straws, wrap them with adhesive tape and let them use their tiny hay bale as a paintbrush). (Open costume-pig) Print for each child. Let them create their pig costume. (Open perpetual calendar-Little Mermaid) Print and display. Pick among the following activities. Tie children’s feet together using sparkly fabric. Go observe lobsters at your local supermarket. Hang fish shapes from the ceiling. Cut seaweed out of colourful construction paper. Provide wigs children can wear. Make paper mache seashells (use real seashells, apply Vaseline all over, wrap them with several layers of paper mache, let dry, and paint). 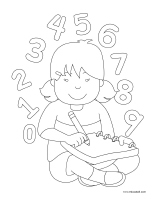 (Open coloring pages theme-Books) Print for each child. (Open songs & rhymes-Books) Print.